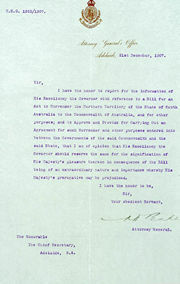 Two documents are shown here: the Bill passed by the South Australia Parliament to transfer control of the Northern Territory to the Commonwealth of Australia, and the covering letter advising the Governor that the Royal Assent was required. 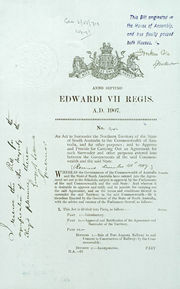 When the Royal Assent was granted on 19 March 1908, the law transferring control of the area annexed in 1863 as the Northern Territory of South Australia was enacted. As early as the 1880s, the continued failure of Territory enterprises led to suggestions that the Northern Territory be given back to Britain. In 1895, five of the witnesses who appeared before the Northern Territory Commission argued that point and only one suggested any kind of federal responsibility for the area. However, by the time the Commonwealth came into existence in 1901 it was clear that Australian nationalist sentiment was strong enough to ensure that no part of the continent would be returned to Britain. If South Australia was to rid itself of the Territory, the Commonwealth was the only likely taker. Territorians voting in the South Australian Federation referendum in 1898 had opted for Federation by a ten-to-one majority. Premier Frederick William Holder had nothing to fear from Territory opinion when, in April 1901, he offered the Territory to the new Commonwealth Government on condition that they accept both land and liabilities. The Commonwealth Parliament had not even met and had more pressing concerns in the first years. As well, conservative opposition in the South Australian Parliament delayed negotiations. 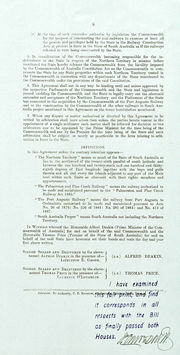 In December 1907 Prime Minister Alfred Deakin and South Australian Premier Tom Price executed a formal agreement for the Northern Territory transfer. 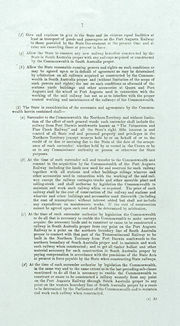 The South Australian Parliament then passed this Bill which became its Surrender Act, with a copy of the formal agreement scheduled to it, and the Commonwealth passed an Acceptance Act. Powell, Alan, Far Country: A Short History of the Northern Territory, Melbourne University Press, Melbourne, 1996.